Earth Stumbling: How many billionaires does it take to feed a child? 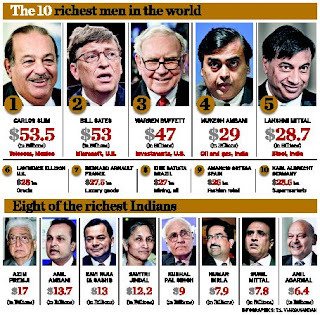 India claims over fifty billionaires, making it one of the top 5 billionaire nations of the world -- and that's billions in terms of US dollars. The economy, though a bit shaky at the moment, still soars high. Then why the downturn when it comes to child development? Save the Children's Child Development Index recently ranked India at 112 -- down from 103 in 2004. Meaning, while all the talk has been about India's soaring economy, her children have been left "eating air" (a common Hindi phrase, "hawa kha rahe hai"). From raw sewage in India's rivers and being ranked worst air in the world to high malnutrition rates among children and adulterated milk, this year's reports have not been kind to the nation. This only confirms that when the rich get richer their affluence does not "trickle down" to the poor. It gets stuck somewhere... maybe buying iPad apps? Who knows? This is confirmed by the statement by India's Planning Commission that "the benefits of high economic growth have not trickled down to the bottom 15% who are the most disadvantaged in the country" (as discussed previously). So what is going on? According to a Down To Earth report, the problem is not that there aren't enough programs but that they are not implemented properly. In other words, the funds get stuck -- either in the pockets of the billionaires or just in the wrong pockets in general. Money in the wrong pockets is a major problem all over the world. 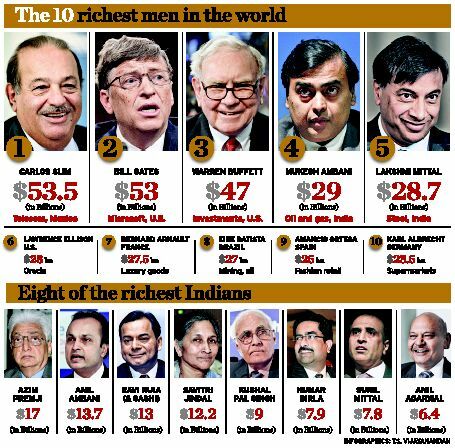 So as not to be overly hypocritical, it should be noted that while the US has over 8 times as many billionaires as India does and holds the number one spot in terms of number of billionaires (China holds the number two spot), it still only ranks 24 while China ranks 29 on the index. So how many billionaires does it take to feed a child? In the end, how can this be fixed? Well, it's not like world leaders haven't been working on this for a long time. First of all the Child Development Index is a ranking system. Some nation has to be ranked 112th just as one needs to be first (Japan) and another last (Somalia). In fact, most of the countries improved since previous rankings. However, India as an "emerging economy" is the only one that dropped in rank. So, what can be fixed? Don't rely on government structures, especially if (as) they are run by people who either don't care or don't know what they are doing or (sadly in most cases) both. Empower whole communities to believe -- not in money but in themselves. We can blame the government, but if the people do not fundamentally believe in change, then what's the use? Find honest local heroes. Who are these people? They are doing it without the money and doing it better. Make friends with them. Get know them. Walk in their shoes. Let them open your eyes. You help them in whatever sustainable way. The rest you'll find in books and in long, long documents from the UN written by very smart people. The principles above are not really new but have been becoming more and more clear to me the past few days as I've been reflecting on my last 10 years in South Asia and visiting China. So really, how many billionaires does it take to feed a child? Well, someone could account for a country's number of billionaires and correlate it to their Child Development Index, deriving a complicated algorithm. But while that's happening, I think I'll sneak out and go figure out a way to help some local heroes that I know. What do you think is needed to change a nation's Child Development Index?